As #winelovers we enjoy wines from all around the world but to be frank, most of the time we are only faced with the “main/international” grapes such as Cabernet (sauvignon and franc), merlot and chardonnay among a few others. When visiting winemakers, we always let them know that we love so very much their experimentations, terroirs and sometimes even their obscure grape varieties. We ask them to use more autochthonous varietals (as so many did last year at the 2012 European Wine Bloggers Conference in Izmir – Turkey) even if most of the time we don’t understand how hard is to plant them back (loss of heritage, clonal or massal selection, slope adaptation, yields management among so many other parameters). This explains why it is important for countries such as France to protect our wine diversity, our ampelographic heritage and of course our past and present research. 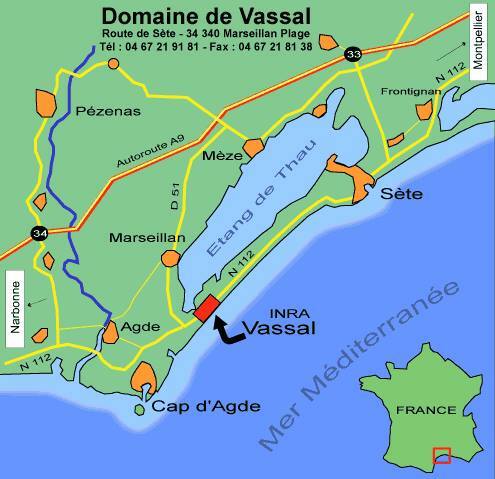 This may be obvious for us (#winelovers) however, by now the French Ampelographic Conservatory INRA – Domaine de Vassal (south of France) which inventories over 7,000 varieties coming from more than 40 countries is in great danger due to economic and political pressure. Relocation is not an easy process when comes to vines and world heritage. Some vines are not grafted (prephylloxeric vines) and can only survive in specific soil such as that of Domaine de Vassal (big lot of sand). “This extraordinary botanical collection, which could be considered as “The Louvre Wine ” was started in 1876 at the National School of Agronomy in Montpellier and was established in 1949 at the Domaine de Vassal . The vines are rooted in the coastal sand protected from the risk of contamination and the dreaded phylloxera . The devastation it has caused there are precisely two centuries behind the conservatory. 27 hectares, is now flourishing old forgotten varieties, such as unusual varieties of the world’s great wines. The current genetic erosion due to the work of selection makes it essential to maintain the conservatory. It is indeed an indispensable source of genes for crop improvement and access to the wine biodiversity. It is important that all consumers, citizens and leaders understand what is happening and get mobilized to maintain the integrity of our “vine Louvre” and keep our extraordinary and national living heritage. If you feel the same and really love wine diversity, vine heritage and a winemakers work, please do sign this petition and share it with friends an colleagues! ** This article is from Vincent Petre, a Champagne Producer, a Bubbly friend, a #winelover blogger.. and has been translated in other languages as well around the Globe.